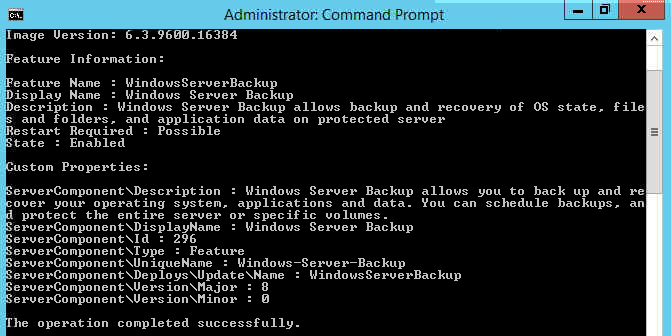 One of the unique issue encountered was of missing “Windows Server Backup” features in “Add Roles and Features” . There are various reasons which may result to the situation however below are the steps to fix the issue which you may try to fix the issue for any other role or feature . NOTE : All commands should be executed in elevated mode. 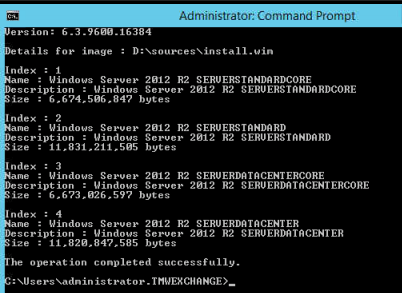 Windows Server Backup was not listed in Features while using “Add/Remove Roles and Features” from Server Manager. Running wbadmin.exe gives error “Unsupported 16-Bit Application”. You will need Windows 2012 R2 ISO/DVD attached to the Machine. Based on the operating system installed you will have to select the index number. As in my case it was Standard so I selected number 2 . Once the image file is mounted you may navigate to the folder and can have access of the files. You may find the below mentioned as output in the list of available listed features. Unmount the image which we used for troubleshooting purpose as best practise. Now you may verify the presence of feature/roles in Add/Remove Roles and Features via Server manager. Your website offered us with useful information to work on. You’ve performed an impressiv job and our entire group will probably be thankful to you. Youre so cool! I dont suppose Ive learn anything like this before. So good to find any person with some authentic thoughts on this subject. realy thank you for beginning this up. this web site is something that’s needed on the internet, somebody with a bit of originality. helpful job for bringing something new to the web. Cyril Pearson / My PC has this problem and I foleowld the procedure listed here. On reboot the computer crashed and I had to go to the last best known configuration to boot up. The named filters are now missing from the regedit page, but are there if I access it via the search for file facility.Will soon shoot it or me!! One of us has to go! !